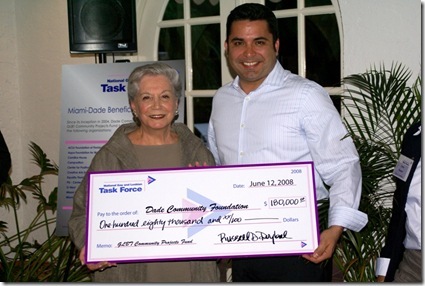 Miami, FL, June 13 – The National Gay and Lesbian Task Force announced at a Coconut Grove reception last night that $200,000 from the 11th Annual Miami Recognition Dinner and the 2008 Winter Party Festival will benefit the local Miami GLBT community. Of that amount, $180,000 will be granted to Dade Community Foundation’s GLBT Community Projects Fund to be disbursed to local organizations providing critical services to LGBT people. The remaining $20,000 will be used to conduct a long-term strategic planning process for the future of the Winter Party Festival. Last year the Task Force’s donation to the Foundation was $160,000. 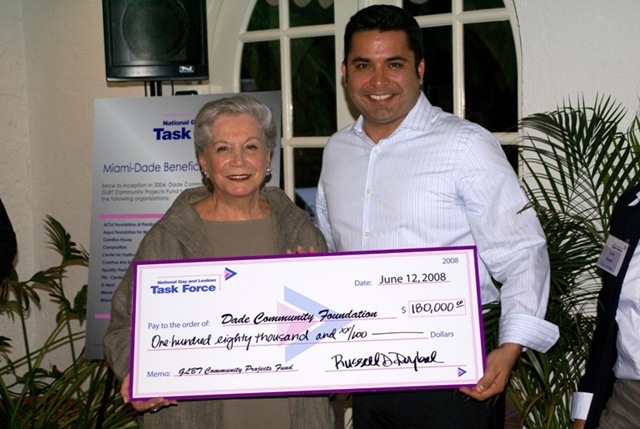 Roybal presented the check for Dade Community Foundation to Ruth Shack, the Foundation’s president and a Miami Recognition Dinner honoree in its inaugural year, 1997. The reception was held at the home of two more previous Recognition Dinner honorees, Mark Steinberg and Dennis Edwards, who also underwrote the event. Bacardi USA, a national corporate sponsor of the Task Force, provided spirits and bartenders. The Task Force assumed responsibility for the Miami Recognition Dinner and Winter Party Festival after its previous owner, the Gay and Lesbian Foundation of South Florida, closed its doors in 2004. In acquiring the events, the Task Force agreed to return two-thirds of the net proceeds of both events to the local community through Dade Community Foundation, which established the GLBT Community Projects Fund to administer the grants. Over the past four years, the Task Force has given approximately $650,000 raised through the two events to the Foundation. Grant recipients from the Fund have included ACLU Foundation of Florida, Aqua Foundation for Women, Equality Florida, Miami Gay & Lesbian Film Festival, Pridelines Youth Services, Safe Schools South Florida, Switchboard of Miami and 15 other organizations. The Task Force used last night’s reception as a platform to announce the first honoree for the 12th Annual Miami Recognition Dinner, which will be held October 18 at the InterContinental Miami. The 2008 Eddy McIntyre Community Service award will be presented to Joan Schaeffer, a constant supportive presence in the LGBT movement and the larger Miami-Dade community for more than two decades. The Task Force anticipates announcing additional honorees within the next two weeks. The Task Force has already received sponsorship pledges for over $50,000 for the 12th Annual Miami Recognition Dinner. Burger King, Dade Community Foundation, Greenberg Traurig, P.A. and James G. Pepper have committed to be platinum sponsors of the event; Akerman Senterfitt, Comprehensive Money Management Services LLC, Mario Magcalas, MD, P.A. and Olive Watson & Joanna Grover/Watson are confirmed as gold sponsors. For more information on the National Gay and Lesbian Task Force or the 12th Annual Miami Recognition Dinner, please contact Michael Bath at 305.571.1924. The National Gay and Lesbian Task Force was the first national lesbian, gay, bisexual and transgender rights organization and remains the community’s uncompromising progressive voice. We fight for equality and justice by building grassroots power through training, advocacy, organizing and forward-thinking research and expertise. We challenge not only the status quo in mainstream America, but politics as usual within the LGBT community, and we refuse to make political compromises that would leave anyone behind. The National Gay and Lesbian Task Force Foundation is a 501(c)(3) corporation. More information is available at www.theTaskForce.org.